Turkish chefs blend Turkish and Ottoman culinary traditions with world cuisines for global success. While some chefs are spreading the legacy of the Turkish and Ottoman culinary traditions, others are creating fusion cuisine with Turkish twists or mastering the Asian culinary arts. Check out this list of the top 10 Turkish chefs to look out for and feel proud of. Born in Tunceli in 1976, Ali Güngörmüş became the first Turkish chef to ever receive a Michelin star, which he did in 2006 for his restaurant Le Canard Nouveau in Hamburg, just a year after taking over. In 2014, he opened Pageou in Munich, which serves "bistronomy," in other words, fine cuisine in a more laid-back atmosphere. With three cookbooks to his name, Güngörmüş also teaches his take on Mediterranean cuisine the first Saturday every month in Munich. 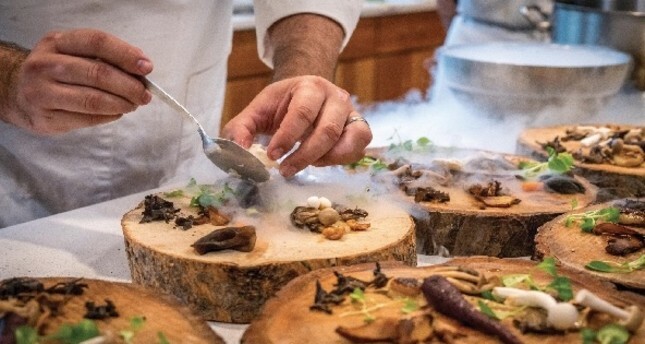 The second chef of Turkish heritage to receive a Michelin star was 34-year-old Serkan Güzelçoban, who did so in 2014 with his restaurant Handicap in Künzelsau, in which half of the staff employed are either physically or mentally handicapped. He now serves his trademark Orient-meets-Occident cuisine at Kleinod, housed in the Orangerie of the Hofgarten in Öhringen. Born and raised in Germany, his family hails from Denizli. Certainly one of the most colorful stories among the Turkish chefs sowing roots abroad has to be that of Mehmet Dikmen and his restaurant Burgaz Ada in Tokyo. This chef from Kastamonu was a participant in the Japanese cooking competition "Go, Kitchen, Go!" in which 200 contestants competed for a year and a half to win $1 million - which he did. With that, Dikmen proceeded to open Burgaz Ada in Tokyo, which is considered one of the best restaurants in the Japanese capital. Bet you didn't know that one of the world's top sushi ambassadors is a Turk. Considered to be one of the top 30 sushi chefs in the world after qualifying for the annual World Sushi Cup in Japan in 2017, where he also received a "black belt" for culinary art, Onural has two highly acclaimed restaurants in California famed for sushi and pairings. In 2015, this 35-year-old chef, who was born in Buffalo, New York but grew up in Ankara, was also named America's best new chef by the publication "Best Chefs America." Onural opened his first restaurant, The Venue Sushi Bar & Sake Lounge in Palm Desert, at the age of 26, while his second venture, Sandfish Sushi & Whiskey in Palm Springs just celebrated its one-year anniversary. In Turkey, we all know and love him from Masterchef, but Turkish chef Somer Sivrioğlu is also a well-known television personality in Australia, where he has been introducing elegant and modern Turkish food to Sydney at his two restaurants Efendy and Anason. Hailing from Istanbul, the 48-year-old Sivrioğlu went to Australia when he was just 25. Born and bred in Istanbul, Chef Fatih Tutak has worked at the best restaurants in the world, including Noma in Copenhagen and the three Michelin star Nihonryori Ryugin in Tokyo. He is now the chef at The House on Sathorn in Bangkok where he serves innovative Turkish cuisine and which was been listed as one of Asia's 50 Best Restaurants in "The World's 5 Best Restaurants" list. Brought up in London by Turkish-Cypriot parents, Selin Kiazim has become one of the city's most popular rising chefs with her restaurant Oklava, which opened in 2015 and showcases Turkish and Cypriot cuisine. Her most recent venture Kyseri, which opened this summer, is centered on Turkish pasta and cuisine from Kayseri. In 2017, Selin also released her cookbook Oklava and was one of the winners of BBC Two's television series "Great British Menu." Turkish chef Dilara Erbay walked away from her culinary fame in Istanbul to open an artisanal bakery in Brooklyn, New York. After training at Robert De Niro's Tribeca Grill in New York, Erbay opened Datli Maya and the first Abracadabra in Cihangir and then its flagship in Arnavutköy, which fast became one of the most happening spots in town. However, seeking new horizons, Erbay returned to New York to transform her Abracadabra concept into an artisanal deli serving healthy and organic food with a Turkish twist. The first Abracadabra in Brooklyn opened in 2017 and last year her newest venture, Abracadabra Magic Deli, followed. Affordable, comfortable and hip in the "Burning Man" vein, Abracadabra is fun and colorful, has tantalizing treats and even swings as seating. You may remember Yiğit Pura, whom at the age of 30 won viewer's hearts and the title of Top Chef: Just Desserts in the first season of the spinoff of the popular American culinary competition "Top Chef in 2010." Born and raised in Ankara, Yigit fast become San Francisco's sweetheart and the city announced Nov. 17 as Yiğit Pura Day to celebrate his win. In 2012, Pura started his first high-end bakery, Tout Sweet, in Macy's at Union Square in San Francisco and then two years later opened his second Tout Sweet Patisseries in Palo Alto. While they closed just a few months ago, Pura became the executive pastry chef for San Francisco's Global Gourmet Catering, which runs the food and beverages at some of San Francisco's most iconic locations, namely the War Memorial Opera House, Davies Symphony Hall, the Herbst Theatre and Veterans Lobby, which includes the venues Cafe at the Opera, the North Box Restaurant and Cafe Valor, as well as intermission bars. Have you heard of Hüseyin Özer? Because most Londoners have, which is why he certainly deserves an honorable mention and hats off to him for single-handedly revolutionizing Turkish cuisine in the 80s in the British capital by elevating the döner kebab stereotype with his upscale Sofra and Özer restaurants. His is a true Cinderella story. Born in a village in Tokat and disowned by his family, Özer didn't get to go to school and taught himself to read. His brother tried to poison him and by 11, he was living on the streets in Ankara, homeless and sleeping in public toilets. By the age of 26, he somehow managed to get to London where he began working in Kebab shops only to take over ownership and turn them into modern, fine dining Turkish cuisine with his Sofra chain. He was a millionaire by the time he was 30, which had multiplied sixtyfold when the Discovery Channel show "The World's Richest People" documented his story. At almost 70, Özer has owned nearly 20 cafes and restaurants in London and continues to run his two Sofra restaurants in Mayfair and Oxford. He established the Huseyin Ozer Education Trust early in his career and has been given an honorary doctorate of letters from the University of Westminster.